It's my fuel. My driving force. I've spent so much energy over this last year to just "keep my sh*t together"...to seem strong and "together" and pleasant and comfortable to be around. But as the one-year mark approaches, I am starting to fall apart. I can't juggle it all, anymore. As the numbing shock of the last year is starting to wear away, I am starting to feel the darkening pain. But I do not want to. I have read that the 2nd year is actually harder because of this....the shocks fades away and the reality starts to really set it. I feel my "safe" walls crumbling down around me and I can't control it as well as I used to. Bit by bit, pieces of that not-so-securely-built wall are starting to crumble away. And what lies beneath is my raw anger and devastation. What am I angry at? Oh, everything. First and foremost, I am still angry at God and myself. I am angry that my dreams were shattered. I am angry at the un-fairness of other families getting to keep their two beautiful little girls while I don't. I am angry when I hear a mother not appreciate her role and gift as a mom. I am angry at the expectation that I am just supposed to live with this....like this. I am angry at happy families who have a perfect happy life. I am angry that Ivy does not get to have the big sister that she was meant to follow and learn from. I am angry that this is the path I am meant to walk. I am angry because I feel betrayed by God...and punished by God. I've been reading a book that was given to me. It is titled A Grace Disguised by Jerry Sittser. Jerry lost his mother, wife, and 4 year old daughter all at once in a tragic head-on collision. I feel that his book is one of the very best I've read yet, through all of this. I am only a third of the way through, but his thoughts either mirror my thoughts or have given insight to my emotions and mindset. One concept that he wrote about has been nagging at me ever since I read it - That in avoiding the pain, you only cause yourself to get worse but that we must face the pain, walk into the darkness, in order to start some sort of healing. And, healing does not mean that you get over it or past it or "better". No. Healing means that you start to learn how to live with the pain, for the Rest. Of. Your. Life. Jerry states it perfectly in the preface of his book - "This book is not intended to help anyone get over or even through the experience of catastrophic loss, for I believe that "recovery" from such loss is unrealistic and even harmful expectation, if by recovery we mean resuming the way we lived and felt prior to the loss." "My suffering is as puzzling and horrible to me now as it was the day it happened. The good that may come out of the loss does not erase its badness or excuse the wrong done. Nothing can do that." "...my mourning became too deep for tears. So my tears turned to brine, to a bitter and burning sensation of loss that tears could no longer express. In the months that followed I actually longed for the time when the sorrow had been fresh and tears came easily." "I discovered in that moment that I had the power to choose the direction my life would head, even if the only choice open to me, at least initially, was either to run from the loss or to face it as best I could. Since I knew that darkness was inevitable and unavoidable, I decided from that point on to walk into the darkness rather than try to outrun it, to let my experience of loss take me on a journey wherever it would lead, and to allow myself to be transformed by my suffering raher than to think I could somehow avoid it. I chose to turn toward the pain, however falteringly, and to yield to the loss, though I had no idea at the time what that would mean." "My decision to enter the darkness had far-reaching consequences, both positive and negative. It was the first step I took toward growth, but it was also the first step I took toward pain." "I did not get over the loss of my loved ones; rather, I absorbed the loss into my life, like soil receives decaying matter, until it became a part of who I am." *** "When we plunge into darkness, it is darkness we experience. We feel pain, anguish, sorrow, and despair, and we experience the ugliness, meanness, and absurdity of life. We brood as well as hope, rage as well as surrender, doubt as well as believe. We are apathetic as often as we are hopeful, and sorrowful before we are joyful. We both mourn deeply and live well. We experience the ambivalence of living simultaneously in the night and in the light. ...The darkness lingers for a long time, perhaps for the rest of our earthly lives. ...The choice to enter the darkness does not ensure we ever completely come out the other side. I am not sure we can or should. But is it possible to live this way? Is it possible to feel sorrow for the rest of our lives and yet to find joy at the same time? Is it possible to enter the darkness and still to live an ordinary, productive life? Loss requires that we live in a delicate tension. We must mourn but we must also go on living." "I knew that running from the darkness would only lead to greater darkness later on." I look back over this past year and running is all that I have done. In asserting that, I have realized that running is really just called denial. How did I not know that I have been living in denial? I function best by denying this ever happened. I don't want to face that pain. It hurts like freaking hell! So, I ignore it. That's why I smother my tears and avoid all the sad places and things. If I avoid it, it won't hurt and maybe just maybe, I can get through yet another day. My life is just about getting through one day at a time. Diving into that darkness just sounds like going in reverse. But, I also know that denying and avoiding it hasn't faired me well either. It's been making me physically sick...and darker inside. And, now it's starting seep out the corners. It's becoming a harder struggle to smother it all the time. Facing the pain sounds horrible. And what does that actually look like? Well, this author dove into his darkness and pain by staying up late at night and going through old photos and memories and bringing on the tears and weeping. Sometimes, I don't even know if I know how to do that anymore. I can look at the photos. I can watch most of the videos. So, I'm not exactly sure what that is going to look like for me. 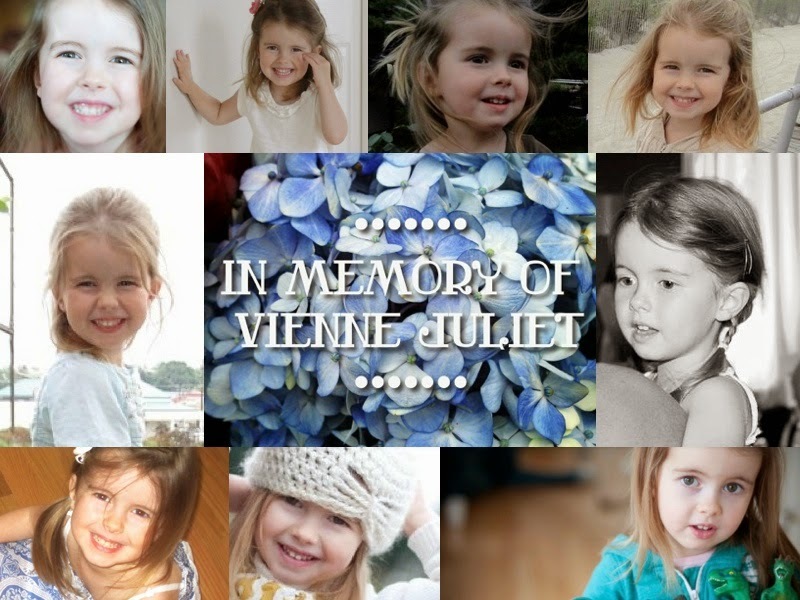 The only video that is brutally unbearable to me is the video that Kinsey made for Vienne's memorial service. The songs that play in that video and the feelings that surround all those memories at that service and during that time make me sick to my stomach. I have only watched that video 3 times since. And, then I don't want to over-watch it and become numb to it. So, I guess this is a topic that my counselor is going to help me navigate through. I have to start facing it because I have to start forgiving myself...and I have to start protecting myself from a "greater darkness" that could occur. And, eventually I hope to come to some sort of understanding with God. Right now I feel like He and I are just going to have to agree to disagree on this one. I will never agree with His decision to say "no" to our desperate pleas to save her life. I will never agree with the plan for my child to die. There will NEVER EVER be a point in my life when I will stop and say "oh! I get it now. I see why Vienne had to die." NO. Never. There is NOTHING that could occur in this life that would be worth sacrificing my child's life for. So, I am just going to have to disagree on this one. And, I believe that is ok. There are plenty of choices He made in the New Testament that I have never fully agreed with or understood. But, the main thing is that I do still believe in Him and I do believe He is the one and only God and I do believe that His Son was sent to die here for us. (But, the loss of His Son was WAY different than my loss...yes, He lost. But, He also got Him back 3 days later!) And, loving Him right now....well, that's something I'll have to work on. So anger is my fuel, my driving force. And, the anger that boils beneath the surface helps me to keep going and denying or avoiding my living hell. Yup. That pretty much sums it up. Pretty, isn't it? I don't really have it all together AT ALL. I am a mess. A running angry mess. But, I am aware of it all. That's one thing in my favor. I am so blasted conscientious and self-aware. So, I know the things I need to work on. In an earlier post, I alluded to some changes that are going on this summer. The main and only one worth mentioning is that we are moving again, at the end of this month. We are moving back to the area we were living in when Vienne passed away. I have been running from it for this past year. It is time to start facing the pain...one step at a time. We love the area we were living in and realize that there is no other place we'd rather be. We love all that it has to offer in places to walk to (4 parks, 3 coffee shops, our health food grocery store, a splash pad, a play boutique, a library, restaurants, walking paths, toy store....). And, mainly, we also realized that we want to raise Ivy in the area that her sister loved and show her all of her sister's favorite places. So, we will return. And, it will be a good stepping stone for us. My first step into facing the darkness. What a terrifying and dark journey you guys have been on. It is so overwhelming to think of how many parents have walked this dark road over the ages. What a cruel and broken twist to this life. It doesn't make sense. I find myself struck speechless. I don't have words of comfort. I have no advice (what possible words of advice could someone have when they've not been through this?) I am just sorry. So sorry you are enduring this pain. May this next year have moments of light and healing. May you be given unimaginable peace. Peace in the darkness, not the ability to forget the pain, but to somehow...someway... find peace IN this pain. May you find a sturdy vessel to find rest and sleep in during this tumultuous and unexpected storm. :( I love you, friend. Though difficult, I appreciate this post alot. My dear friend (actually, my pastor's wife) had the following words for me and it helped me accept where I am...in the darkness of sorrow. It helped me to not push myself, to be honest with where I am...waiting and praying. She said "...you're in close company of others who have had similar "dark night of the soul" experiences. She said she would wait with me and pray for me. I loved it that she did not try to fix me or rush me...but to just "wait" with me. You cannot rush grief. Another dear, Godly friend (a licensed therapist who has counseled me wisely in years past) affirmed that, yes, it is just fine to be in disagreement with God's decision to not intervene - it is ok to agree to disagree, to dislike this "plan"...if indeed it was His "plan". I guess I just needed to have that affirmed. God's not going to try to twist my arm into changing my thinking, nor will He abandon me because I DON'T LIKE THIS. Fact is, I hate this. I could never accept this as being "ok". It's not ok. All the while, similar to what you stated, Jen, I know God is the same God that I trusted and revered before Vienne died...the same God that I shared intimacy with. I miss that intimacy with my Savior. Therefore, my prayer is that someday that will be restored and perhaps even renewed in a new and stronger way...even as I agree to disagree. You know I will pray and stand by you as we wade through this deep valley, this ocean of sorrow, my daughter. The tides will change...days of raging, pounding waves - and days of still smooth & icy glass reflecting warm sunlight. Thank you for sharing the quotes from the book. They do resonate. I look forward to reading it. I love you to China. Friend...like Lacey said, I truly have no words. I find even myself returning to those feelings of rage and anger that I was completely consumed with almost a year ago on that horrific day. We all unfortunately try to become numb to the unimaginable pain of this for you so that we too, can not become too dark. Too angry at God. Too far from that relationship that we all need. But as this year mark creeps up, I feel it bottling in me again. I cannot fathom your feelings these next few weeks...not to mention how you feel every day really. That book sounds very good and it must be comforting a tiny bit to see that someone else has felt the way you are feeling and put it into words you can relate to. I'm thankful for your counselor..that you finally found the one you need for both you and Mark. I'm excited for your move back to the area you both love. There are always things to look ahead to...especially because of your sweet Ivy...but how we wish the joys of the future could outweigh the sorrows from the past. Vienne will always be in your "now." Past, present and future. Always. She will be in all of ours as well. I love you friend. I want to continue to renew my relationship with Christ, if only so that I can be more of a prayer warrior for you. I too have walked through those emotions. It's not fair...it never will be. I'm so sorry that you and other mamas know this pain. No one should know it. I can tell you from my experience that wrestling with God only made our relationship stronger...so don't be afraid to keep challenging Him. I can also tell you that climbing out of the pit of grief (too many times to count) has molded me into a completely different person. I see people differently...I see life differently. I can also assure you that it won't always feel like this. The days leading up to the one year anniversary were some of the darkest days of my life. But after we made it through we were able to finally say that "we are better now then we were a year ago". That was so helpful for us to be able to look back and see that although we were still consumed with sadness...we were in a better place now than we were watching him die. I never thought that it would get better. Ever!!! But I can tell you that although time heals nothing, walking through the grief and learning to live a different life than you wanted to expected does part the clouds for the blue sky to shine. Now...instead of having a rare blue sky day...I have rare grief filled storms. It's not the standard any more. I encourage you to keep walking that path...it's your journey to navigate but there are others here to help you and guide you. Thank you for the insight, Trisha. And, for the understanding. It means a lot. Jenny you've been on my heart and in my prayers so much lately. Now I know why. I continue to pray and grieve with you. I wish there was more I could do. Thank you, always, for your prayers, Jodi. Your understanding and thoughtfulness means so much, sweet Tiffany. I am sorry we both have to walk this wretched life. Wow, Emily, that was a really good article. Thank you for sharing. Oh Jenny, I too have been dealing with a resurgence of the dark night of the soul I went through last year after Vienne passed. It truly rocked my world to witness your loss (even at a distance). I can only imagine what a struggle it must be to embrace the grief process and the pain rather than shielding yourself from it. So much like childbirth... walking toward the pain instead of running from it. It is so counterintuitive, but I believe that you are right that it is the way to protect yourself from a deeper bigger darkness. Oh Jenny, my tears still flow for you and for Vienne and for Mark and for Ivy. I am so deeply sorry. Please know that you have many who love you and who are contending for you daily. We just went to a camping trip celebration of life for Ben's best friend who died in a plane crash three years ago. His mama still weeps... and I still hold her... she does have joy... she has seasons that are harder and seasons that are easier. The human condition is such a painful one. My mom once told me "We are not human beings having a spiritual experience. We are spiritual beings having a human experience." I am so thankful that, in the midst of your deep darkness, the reality of your spiritual experience (and Vienne's spiritual experience) stretches out before you with abundant promise. Praying for you always, Jenny, and love you so. Chelsea~ This is a very belated response to your comment but I just wanted you to know how very much it meant to me to receive. I will cling to the quote you shared that "we are spiritual beings having a human experience". This human experience couldn't pass quickly enough for me. I have been thinking and praying for you this week Jenny. I hope all is working out with your move and that all the details fall into place. I can't imagine a deeper darker place other than the one that you are in. I was at Cannon Beach this weekend and I thought of Vienne nonstop. It was as though I could feel her presence because of how you have scripted her life on this blog. You and Vienne have changed me forever, thank you. Prayers hun.